This is a continuation of my previous post. Please read the previous posts here, Part 1, Part 2, Part 3, Part 4, Part 5 , Part 6 , Part 7 ,Part 8 ,Part 9 , Part 10 , Part 11 , Part 12 ,Part 13 and Part 14. If marriages are made in heaven, it is literally so in the Hindu system because of the belief that all major events of life are influenced by heavenly bodies; that is, by the stars, planets, moons and so on. A simple task of fixing the marriage date, for example, calls for a consultation with an astrologer and he decides on an auspicious date, or Subha Sahit, after gauging the influences of the celestial bodies on the bride and groom based on the dates and times of their birth. So, for our engagement, fixing the date became a long and tedious process because there were so many things to be considered. First of all, it was our birth chart. Astrological compatibility consideration is not only a mere ancestral practice but is a way to get the knowledge regarding the nature, features, love and the social communication features of the people. Unless and until compatibility is found between the two persons, they can’t hold a life-long relationship happily. Since it is a very difficult task to get an accurate knowledge of a person’s nature etc. before a marriage (or a long-term relationship), Astrology can definitely help the two lives a great deal. The other main factor was I was leaving for Sydney at the end of January and the dates had to be before I left. We somewhat already knew what the astrologer would tell our family about AS and my horoscope compatibility. 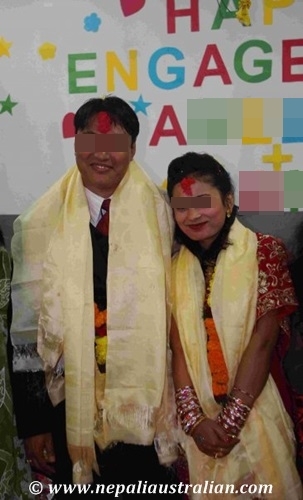 AS had a flatmate who was good with astrology so before he came back to Nepal, he asked him to see how compatible we were; as we knew it would matter to our family. The score of compatibility points is much above the mean. This speaks of only good in all respects pertaining to married life. Marriage between the prospective pair is highly recommended. Only the very best in all the respects could be taken as destined. Normally a match with 18 or more points is considered good. 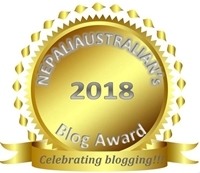 It was a relief for both of us and when our parents did the same thing in Nepal, they were happy with the result as well. Finally, a date was decided, few days before I was to leave. As always, it was meant to be a small ceremony between few close family and friends but it turned out to be a function for around 150 people. Initially, we were planning to have the ceremony at my house, but with 150 people, it was not possible so a venue was arranged. When the big day came, I was tired and excited at the same time because there was so much to be done in leading up to the day. I had to shop for the outfit I was going to wear that day. Then I also had to shop for outfit AS’s family was giving me. My MIL thought, it will be best if I buy those stuff myself so I would wear them in the future. That was really nice of her. I was preparing for the engagement and going to Sydney at the same time. I didn’t have many days after the ceremony so I was trying to do as much as possible before hand. The day before the engagement, I went to the party venue with some of my good friends to decorate the place. I wanted to do a feature wall and decorate it so that it would look like an engagement venue. So we printed out our names including Happy Engagement in colourful papers along with lots of hearts and stars. It took ages to cut them and then stick them on the wall but the effort was worth it as the place looked nice after the decoration. I was really grateful that I had AS and a bunch of my friends to help me. On the morning of the engagement, I work up early. I already had my aunts and cousins at my place. After a shower, we had breakfast and it was time to get ready for the occasion. I had bought a red sari for the day and my mum had made sure that all the jewellery was ready for the day. I put on my sari, chura, jewelleries and my cousins did my hair and makeup. I was dressed in red sari with golden work. Had my hair and make-up done like a Nepali bridal. I was feeling as if it was my wedding, not an engagement, as there was so much fuss at my house. Finally, everyone was ready and we headed towards the party venue. Many of my relatives were already there and the party was going on full swing. People were enjoying their entrée and drinks. After what seemed like ages, AS and his family finally arrived at the venue. AS was dressed in a dark blue suit and I swear he looked so handsome. My dad welcomed him at the gate with tika (a mixture of rice, yogurt and vermillion) and garland and brought him to sit next to me on a sofa. When I saw him with his family that day, my heart was melting because everything around me was so real and we are making our relationship official now. The groom’s side followed the tradition and brought trays and trays of sweets, fruits and gifts for me. A few days ago, we had ordered a big cake as well so it was also ready. First of all we waited for the auspicious time and then the priest started to say few mantras. Then the priest put tika on our forehead and told us that that we should exchange the rings. So in front of our families and friends, we exchanged rings and we were officially “ENGAGED”. It was followed by the elders putting tika on our forehead and blessing us for a happy life together. It started with our parents followed by his and my relatives. At the end, we had so much tika on our forehead that it kept sliding to our nose. Some of our relatives had brought us gifts and flowers too. After that we cut the engagement cake, one of the yummiest cakes I have ever eaten; with fresh cream in black forest base. Once we cut the cake, we fed it to each other. As there were too many people around, I took a small bite of the cake and his relatives were encouraging me to have a big slice. It was all so much fun. Then we gave the cake to our parents and then to the rest of the guests. After the main ceremony, everyone was buys enjoying the party with the food and dancing. We had photos taken with everyone as well. After a few hours, when the party started to come to an end, AS and his family left and we were left with only a few of my close friends and relatives. We didn’t want to stop the party so we continued to party until after midnight and I made sure every one of my relatives were on the dance floor including my parents. It was really fun. Fun was over for a while after this event because after a few days of the engagement, I left for Australia. I will continue about that in the next post. Take care till then. 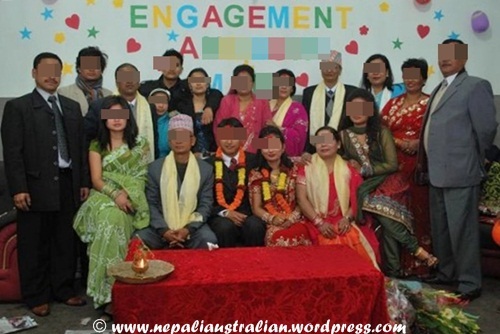 This entry was posted in Celebrations, Marriage, Our Story, Our Wedding, Relationship, Wedding and tagged auspicious date, australian, hindu system, horoscope compatibility, long term relationship, love story, Nepali, nepali engagement, nepali wedding, Nepaliaustralian. Bookmark the permalink. Lucky I wasn’t there or I’d have been stealing some extra Black Forest Gateau. I love it. You two looked fabulous on that big day. Actually, the whole family looked great. And, I’m enjoying your continuing story, hoping that you two always remain a perfect match. All is well with you and with AS, I trust. How can I forget you Sid. Hope all is well at your end. Well then there’s another school of though that says that there is an optimal range of points, it should not be too high nor too low. I guess we scored more than what’s required. Thanks for the wonderful photos and memories shared. I didn’t have an official engagement day as such (which is good because my husband and I are the deepest introverts you will run across). My then boyfriend proposing to me on one knee was great and was our engagement. Looking forward to detailed descriptions on the wedding and wedding photos. Memories are priceless, and your words here are like another picture album. thank you for sharing this tradition!